A hands on and interactive workshop which gives students a chance to learn about clothing, marriage, religion, food, the guilds, surgery & medicine and arms & armour. Display area: School hall, gym, drama room, dance studio, or similar large indoor space. 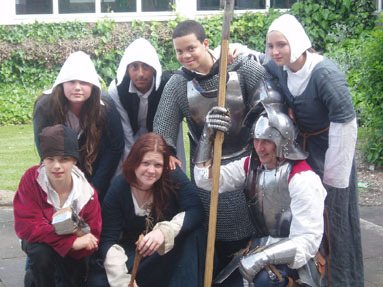 Medieval Clothes – 17 students are dressed in medieval costume, including lords, ladies and a priest. All other students have a household tabard, coif and belt to wear. So everybody gets dressed up in some way! Even teachers may dress up if they wish. The clothes are explained to the students who then have to answer questions about what they have just heard. Medieval Marriage – There is to be a marriage! Lord Tudor and Lady Beauforts parents have decided they should marry. This marriage actually happened in history, Margaret Beaufort was married at 12 (a legal age for a girl in medieval times) and had her first child at 13. She was already a widow before the child was born. Her son was of course to become the future King Henry VII. In medieval times the average life expectancy for a woman was 30, so life had to be fitted into a much shorter space of time. Food of the rich & poor – Of course to celebrate their marriage our Lord & Lady must have a wedding feast and servants are brought forth to serve their sumptuous meal (all very good & convincing replica food). The food one could eat in medieval times depended greatly on time of year and how much money you had. Even more so than nowadays. The rich people have meats, sugar, fine wines, spices, gold & silver tableware. The poor have some pork if they’re lucky, cheese, bread, simple fruits, grains and very basic wood or pottery tableware. They may not even have food at all. Will our Lord take pity on them that there has been a bad harvest this year and give his trencher bread to the poor? Charity for the poor was a good way to help ensure ones place in heaven. But what foods would neither rich or poor possess? 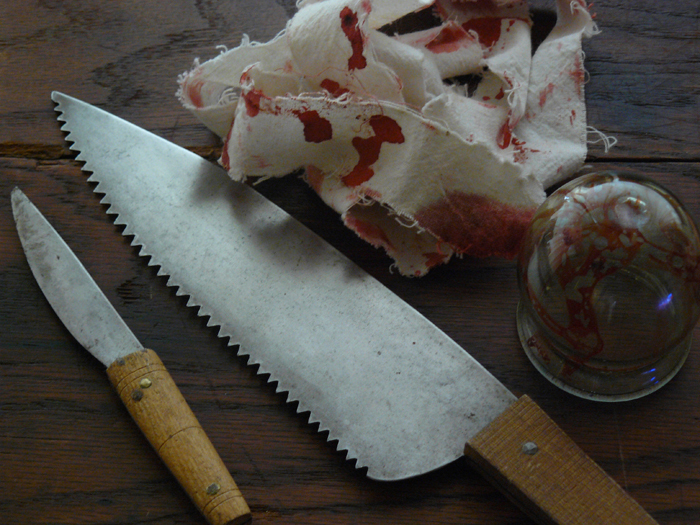 What foods were not eaten at all in medieval England? We answer all these questions. Illumination of a letter D. Illuminators belonged to painters guilds. The Guilds – Lords & Ladies may have plenty of money but most medieval people would have to earn some money perhaps through growing food or by learning a skill and becoming a master craftsmen. In return for a payment from its members guilds would ensure the quality of items, control pricing of goods and look after it’s members and their family in times of need. An apprentice could study with a master craftsman from as young as 12 for many years on no pay. Once good enough he would prove to his master his skill and then he would become a journeyman, journeying from town to town earning money, learning further skills. Till eventually he might make his masterpiece and become a guild master himself. Working in groups students are invited to make their ‘masterpiece’ to join either the woodworking guild, the leatherworking guild or the apothecaries guild by making a box, apron and medicine. Each household must make their own masterpieces to be judged by the guild masters (us or their teachers if willing). If it’s not good enough quality it’s not getting in! The Black Death – Everything is going great, they’re earning money, they’ve joined their guild, what could possibly go wrong? War? Yes, that’s pretty bad but worse perhaps even than war…. the plague! Medieval people have never seen a disease like the plague before, they don’t know about germs and bacteria, most of them never travel more than a few miles from their homes. Why should they worry about a disease in some far of place called China? But the plague spread eventually reaching England in 1348 and killing a large percentage of the population. The black death is stalking our medieval land, indiscriminately infecting students with the plague. A third of the students & teachers are wiped out by the plague and brought forward to the graveyard. One in three of everybody they know has been wiped out by the plague. We describe in detail the different types of plague. But why do medieval people think this terrible thing has happened are the apothecaries medicines not up to the job or is God displeased with the sins of man and this is his terrible punishment. (This section is only run time permitting or on special request). A second marriage – The Yorkists have obtained a papal blessing for the marriage of Lord Neville to Lady Stafford. A second marriage takes place and now the Yorkists are as mighty and powerful as the Lancastrians. The Lancastrians are not happy! This can only mean one thing…. War! Arms & Armour – If grievances can not be settled amicably then there is only one alternative. There were many battles throughout the medieval period and armour and weapons developed a great deal in the 400 years between the Battle of Hastings and the War of the Roses. We look at arms and armour ranging from 1066 up to the late 15th Century and how it developed over time. Why did men wear armour? How heavy was it? How could you kill a man in armour? How did you go to toilet? We have lots of armour, some of which is made specially to fit an average 11/12 year old. They can try it on, feel it’s weight & how well it is made. The mail hauberk & pig faced bascinet are particular favourites. Once they have done this and time permitting we demonstrate how some of the weapons would have been used, the sword, the falchion and the knights weapon of choice the deadly pole axe! Surgery & Medicine – For those not interested in armour they can learn about surgery instead. With so many soldiers about, there is great need for surgeons to treat them. The surgeon shows through photographs the damage a medieval weapon can cause to a human skeleton. Then demonstrates & talks through some of the gruesomest treatments they might have received, amputation(we have blunt amputation tools to demonstate how this was done), trepanning, tooth pulling, arrow extracting, bloodletting (we have live leeches to show) or how to deal with the dreaded tooth worm by use of a hot needle! The surgeons wound man is also a great favourite. We also demonstrate how a physician would find out what was ailing his patient by looking at the colour of his urine, sniffing it and even tasting it! Blood would also have been examined in the same way. (surgery is usually run at the same time as armour, unless time and numbers permit us to run both consecutively). Then the favourite part of the day, to decide who has won they have to shout out their battle cry and see who can shout the loudest! A York a York! A Lancaster a Lancaster! Teacher then decides who has won. It’s a fantastic way to end the morning/afternoon and a superb way to unwind. We explain that in history it was the Tudors who won and see if they can remember their Tudor Kings and Queens.